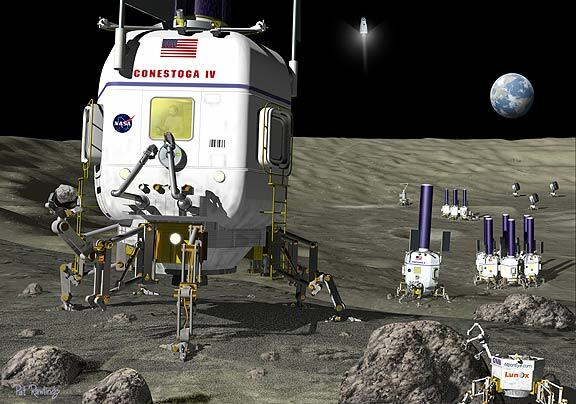 Landing mobile bases on the moon is an idea whose time has come, according to a NASA researcher. Lunar bases that can travel on wheels, or even legs, will increase landing zone safety, provide equipment redundancy and improve the odds of making key discoveries by enabling crews to visit many lunar sites, according to Marc Cohen, a researcher at NASA's Ames Research Center, in California's Silicon Valley. Cohen recently presented his concept in a research paper at the 2004 American Institute of Physics Forum in Albuquerque, N.M.
"If you set up a base at a fixed location on the moon, you are very limited in the sites of scientific interest that you can reach," Cohen said. "What it comes down to is if you're landing a habitat on legs and wheels, it doesn't take a lot more investment to make it highly mobile, provided you have enough energy resources that would enable it to travel great distance across the moon with or without the crew onboard," Cohen explained. Linked mobile moon habitats might travel like treaded trains without tracks, or they could cross the moonscape in a line like Conestoga wagons crossing the American West. Walking or rolling habitats could dock to one another, or circle close together, when they reach a rest or research site, according to designs suggested by engineers over that last three decades, Cohen noted. In contrast, a common scenario for exploration of the moon is that one or more astronauts would travel to a remote site in a pressurized or unpressurized 'rover.' An unpressurized rover trip would only last hours because the astronauts would be in spacesuits for the entire trek. A pressurized rover could sustain astronauts for a much longer trip, lasting days or weeks. "If you are trying to conduct research with pressurized lunar vehicles, you run into many safety issues," Cohen said. To avoid life-threatening or other compromising situations that might occur with only one rover traveling to a remote place, a second rover might travel with the first. "But what if the second rover runs into a problem, too - the same or a different problem? Well, that means a third rover," Cohen said. "So, why not make the entire base mobile, so that all the resources, reliability and redundancy of the lunar mission move with the excursion crew?" Cohen reasoned. "In addition, there's risk if you land lots of immobile modules in one spot -- there is a danger you'll have a very long commute to a place of scientific interest, or can't get there. Then you've wasted billions of dollars. Mobile habitats greatly reduce the risk of finding yourself on the wrong place on the moon," Cohen added. Another advantage of mobile moon habitats is that they will be able to move out of the lunar landing zone, which could be hazardous. "The landing zone poses the problem that once a habitat lands on the moon, it is not prudent to land another vehicle within several kilometers because of safety concerns from ejecta in a normal landing, and in case of an explosive failure on impact," Cohen said. Cohen suggests that mobile habitats must have robust radiation shielding for them to be practical. "Radiation protection remains a challenge and a potential showstopper, as it does for all lunar base and rover concepts," Cohen said. However, there are potential shielding concepts that may well be reasonable, according to Cohen.